Pontypridd host Rhondda Valley neighbours Cambrian Welfare in a first pre-season friendly of the summer on Saturday 11th August. The match at Sardis Road will kick off at 2:30pm. 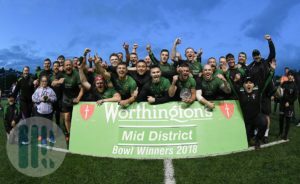 Cambrian finished a close second in Division 2 East Central last season, only a point adrift of Gilfach Goch, but gained revenge by defeating their rivals in the final of the Mid District Bowl. The match against Cambrian will provide Pontypridd with a valuable step-up in preparations for the new season, with an extended pool of players available giving many newcomers an opportunity to impress in a full match scenario. The full Pontypridd squad will be utilised during the course of the match with no limit to the number of replacements allowed. Supporters are reminded that season tickets are not valid for pre-season friendlies. Admission to the Cambrian match will be charged at £5 giving access to all areas of the ground.